A trip to India is a trip to a unique and different country. The Indian society surprises the traveler who decides to travel to India for the first time and traps completely in a kind of spell in which millions and millions of people are hopelessly trapped. India is not a half-way destination. Only on a trip to India can you discover if the magic of this place will conquer you forever. Much of India is rural with many contrasts with the Himalayas to the north, a vast desert to the west, huge and subtropical beaches in the south and a marked tribal culture on the central and eastern borders. One of the most interesting aspects of these groups are their totemic beliefs. According to their religion it is forbidden to exert violence against totemic animals, which are respected with great veneration. They believe in the gods that inhabit nature so they also revere their mountains and forests. Tribes are the traditional social division of any region. These inhabitants are often linked to each other by blood or religious ties. In India, tribes are mostly referred to as Adivasis which is a generic term. Generally they are not very advanced in terms of education, technology, living standards and facilities enjoyed. In the Indian subcontinent, the nature of tribes and their way of living and adapting have changed considerably. In this modern era, the tribes have been reduced to a very small number. Their way of living has also changed significantly. Today, we don’t see the people who belong to a certain tribal ethnicity the way they lived some centuries ago. The Constitution of India recognizes a lot of communities of tribes in Schedule 5. There are as many as 645 tribal communities in India, out of which, some are very popular. Nagas - A group of many tribes! The Naga people are probably the most popular and widely-known tribal community in India. 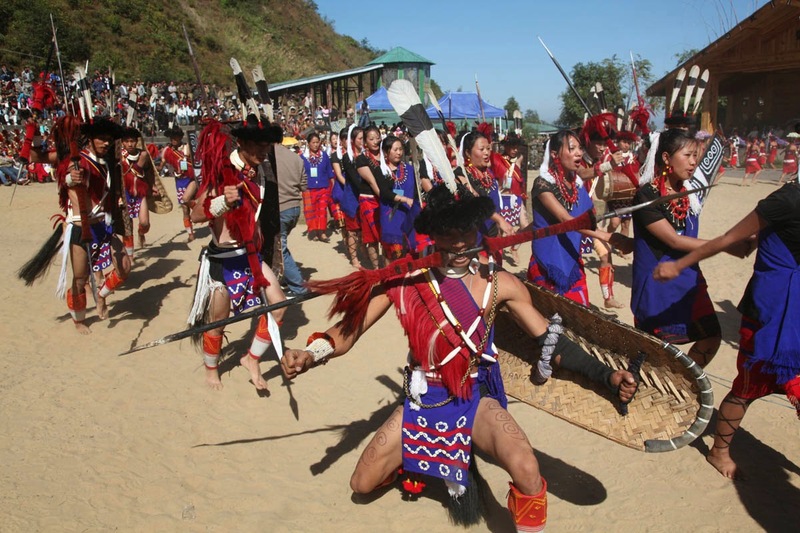 The Nagas group consists of a number of tribes such as Rengma, Sema, Angami, Sumi, Chang, Sangtam, and many more which collectively form the Naga Group. Each of these tribes has their own language and they are mostly derived from other ones, like Tibeto-Burman. They are basically the ethnic groups originating from the North-Eastern part of India, like Manipur, Nagaland, Arunachal Pradesh, etc. These tribes are also spread in Myanmar, Assam and Arunachal Pradesh. Back in the 19th century, many Christian-Protestant communities succeeded in converting people from this community into Christianity. However, this conversion was not very widespread as the people had a sense of resistance towards foreign cultures and succeeded in maintaining their own. Lambani Tribe - The most colorful people! The Lambani is a tribal ethnicity from the western part of India, Maharashtra and Andhra Pradesh to be precise. However, it can be found in the northern parts of Karnataka as well. People from this tribal ethnicity speak a language which is familiar and said to have come from Rajasthan. People of Lambani tribe of India can be distinctly recognised due to their clothing. Women wear clothes and fabrics that are overly decorated and have a lot of ornaments all over their body. These ornaments include bangles, bone-made rings, bracelets and necklaces. On the other hand, men have a type of coarse turban-like headgear. The tight breeches that they wear extend up to the knee or a few inches below it. Another significant thing about the Lambani tribe is that they keep travelling from place to place, earning their livelihood by sell clothes along the beaches or local markets. The Kalbelia tribe is known to have wandered from places to places all through the ancient and medieval ages. The traditional occupation that these tribal people do is catching snakes to trade their venom. And due to this, they are often referred to as saperas. However, the recent enactments in law have forced the Kalbelia tribe to dive away from their traditional occupation and earn a livelihood with their art. In the present day, the Kalbelia people perform a specific type of dance, called the Kalbelia dance, in joyful occasions within their community.